So here’s a podcast you may not have heard yet. It’s about lots of things. Starting up a business, starting a podcast, the future of journalism and the Blockchain, No, come back. 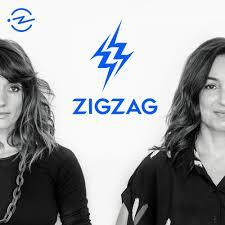 ZigZag is part of the Radiotopia network and is being backed by Civil, which is attempting to create a market for sustainable journalism, based on the Blockchain. Yes, that again. The presenters are Manoush Zomorodi and Jen Poyant who left pretty solid jobs at the New York public radio station WNYC, where among other things, they hosted the podcast Note to Self. They struck out for greater freedom and presumably the chance of owning their own business and managing their own time. And of course the opprtunity to make some more money. Maybe. One of the early startling facts revealed, is that only 2% of all venture capital funding goes to female founders, and the series looks at entrepreneurship, how to build a journalism business and how the blockchain, cryptocurrency and other things we don’t really understand might make that possible. Or maybe not. Don’t worry if you don’t really understand those things, neither do they when they set off on their journey, and there is a lot to enjoy even if the tech leaves you cold. It certainly won’t convince you those things are worth risking your career for. The early episodes focus on getting their business up and running and how they can marry their business ambitions to their journalistic background with their small children also in the mix. But its their radio and storytelling background that pays the dividends here. They know how to weave their tale, building a compelling story across multiple episodes, even if you don’t fully understand some of the detail. Listening to them chase funding around is genuinely gripping, contrasted with their fears in the small hours and their real lives at home. The podcast contains a true sense of jeopardy, can you gamble it all and come out the other side with a career in journalism funded by something most people don’t understand?